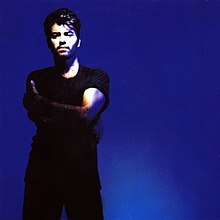 (1996) "Old Before I Die"
"Freedom '90" (also known simply as "Freedom") is a song written, produced, and performed by George Michael, and released on Columbia Records in 1990. The "'90" added to the end of the title is to prevent confusion with a hit by Michael's former band Wham!, also titled "Freedom". It was the third single taken from Listen Without Prejudice Vol. 1, though released as the second single from the album in the United States and Australia. "Freedom '90" was one of a few uptempo songs on this album. It was a major hit and peaked at number 8 on the U.S. charts. The song refers to Michael's past success with Wham!, yet also shows a new side of himself as a new man, who is more cynical about the music business than he had been before. Michael refused to appear in the video and allowed a group of supermodels to appear instead. Michael performed this song, alongside his 2012 single "White Light", during the closing ceremony of the 2012 London Olympics. By 1990, Michael had grown weary of the pressures of fame, telling the Los Angeles Times, "At some point in your career, the situation between yourself and the camera reverses. For a certain number of years, you court it and you need it, but ultimately, it needs you more and it's a bit like a relationship. The minute that happens, it turns you off ... and it does feel like it is taking something from you." He decided that he no longer wanted to do photo shoots or music videos, saying, "I would like to never step in front of a camera again." Although he relented and decided to make a video for his new song, he still refused to appear in it. Instead, inspired by Peter Lindbergh's now-iconic portrait of Naomi Campbell, Linda Evangelista, Tatjana Patitz, Christy Turlington, and Cindy Crawford for the January 1990 cover of the British edition of Vogue, Michael asked the five models to appear in the video. While it was not uncommon at the time for models to appear in music videos, usually such models played the love interest of the singer, as with Christie Brinkley's appearance in her then-husband Billy Joel's "Uptown Girl" video, or Turlington's appearance in Duran Duran's "Notorious" video when she was 17 years old. For "Freedom '90", the five models would not portray Michael's on-screen girlfriends, but would lip-synch the song in his place. This idea was already established in 1985 by Bryan Ferry's music video "Slave to Love". This music video also included the appearance of five male models: John Pearson, Mario Sorrenti, Scott Benoit, Todo Segalla and Peter Formby.